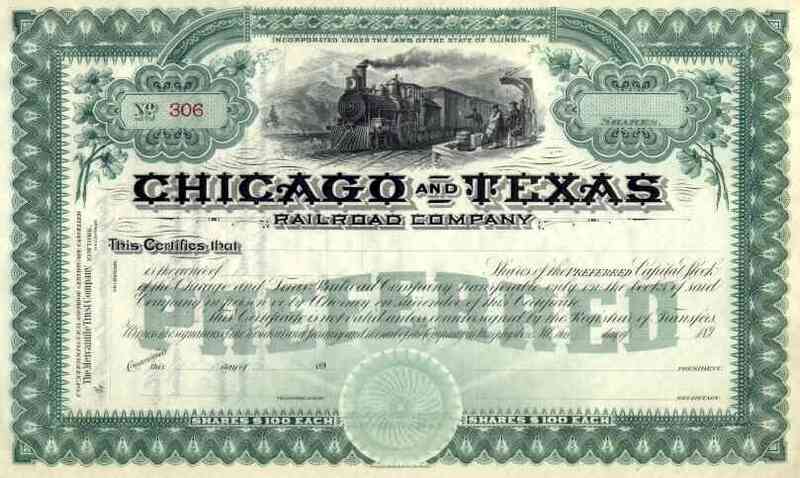 189_ Chicago & Texas RR Stock Certificate. Attractive railroad scripophily certificate with vignette of steam train at station platform. The Chicago & Texas Railroad was a 73 mile line, extending from Johnston City through Carbondale westerly to the Mississippi, and then southerly to Cape Girardeau. The line was originally operated by two companies -- the Grand Tower & Carbondale and the Grand Tower & Cape Girardeau Railroad Companies. They consolidated in 1893, as the Chicago & Texas Railroad. In 1897, the Chicago & Texas RR was leased to the Illinois Central Railroad. Certificate is in EF condition.